The first sign of the Outbreak was in 1956 when a man alleged that his wife that had recently past showed up at his house covered in dirt and was quite alive. From there, the stories became more frequent and bizarre. The outbreak effected everyone differently, some started seeing things, others became horribly disfigured while others simply went mad. By 1973 the area had been taken over by the Outbreak. The government finally stepped in and sent Dr. Victor Flint an epidemic specialist. He and his family took up residency. He setup many facilities to study the Outbreak. Unfortunately, his wife and children were taken by the Outbreak. Shortly afterward the doctor went insane and was never seen from again. With him he also took the location source of the Outbreak. In 1976, with the doctor gone, the government quarantined the area locking everyone in and out. . . Until now. 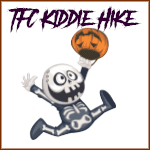 This is the daytime activity hike for children under 10. They will be doing fun crafts, face painting and much more. You will receive $1 off the price of 10 or more! So get your friends together and get scared!